There are many things I like about this scene. The late afternoon sunlight that turns the buildings golden. 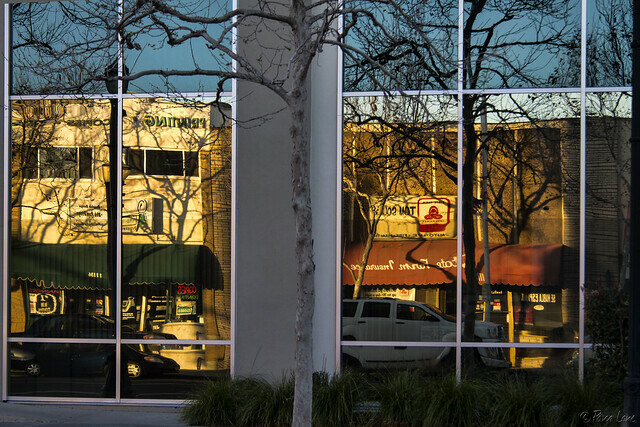 The contrast of the old downtown storefronts reflected in the modern glass building across the street. And the bare branches through which you can see all of this. This picture was taken a few weeks ago. I imagine that these trees are showing signs of spring by now. I love spring, but I also love how the bare, wiggy lines of the branches let you see scenes like this. Nice perspective. This photo is richly colored and textured.